(before i use a bridge with a dcr 250 to catch primary image = 125 mm + 200 mm). I use a DCR 150 to project a correct size on my captor (micro 4/3). 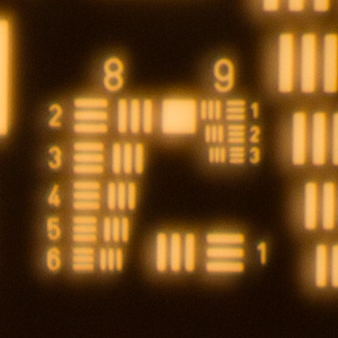 Without magnification is x1.5 (as a crop of the image). With the Bridge camera with Raynox, he's using them together to focus on the virtual image coming from his microscope objective. The Raynox is the Relay lens. Use Manfrotto 454 to Move Bridge camera + Raynox together to alter focus. Then he describes using direct projection. Take soldevilla's Microscope, use Manfrotto to move the large lens, leaving objective still. Focus alters. Ploum is using Infinite objectives, so I think the "tube" lens is staying with the objective in all cases. This method is original and costs are relatively low. Quality will increase in next photo because i optimize all. I work with a manfrotto 454 but uncommon system. No limitation, no motorisation, good precision. Objective : rodagon 135 mm, BW APO 2x, Compon S 80 mm, nikon CFI 4x, APO componon 40 mm, componon 28 mm, APO plan 10x, Mitutoyo APO 10x, BW APO SLWD 20x. Nikon CF EPI 10x, APO SEIWA 20x, MACRO ZUIKO 35 mm, nikon MPLAN ELWD 0.5 40x, NIKON CFI PF 10x. Bridge or hybrid are possible, i change just lens tube of position. Componon and rodagon are not infinite objective. Presence of DCR 250 is not an obligation but my system is done for all camera... And a small adaptation is usefull. Quality seems not deteriorate. Reflex and compact are also possible. The theoretical part is too hard for me. 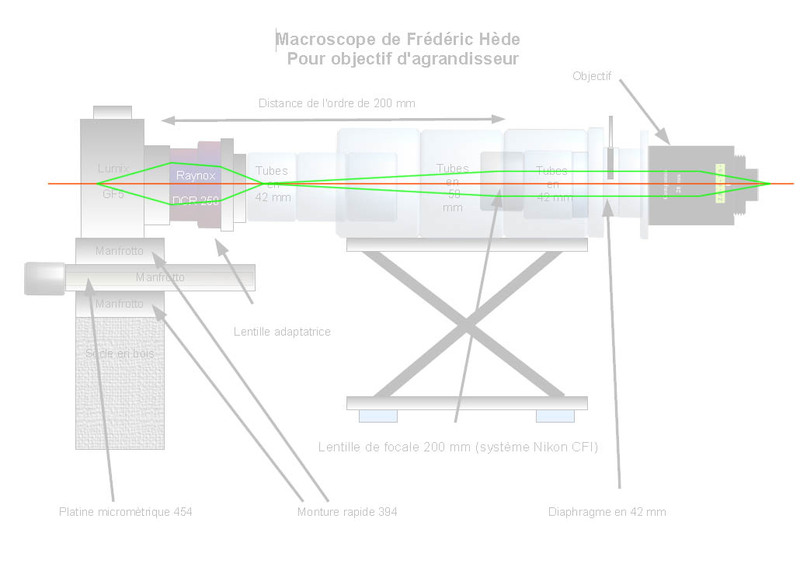 So try this simpler model... Ploum has built a large horizontal microscope. He steps focus by moving the eyepiece. I move this élement and sometimes (anda little more) others . My stacking is better if i take series with a repositionnement of object. In physics it's classic (example analytic physic). I take photo around balance point. I suppose for small gap quality is the same. If the case, soft must change siez of photo and a degradation of the quality is present. Stay around point recommand by manufacturer. I move camera AND objects by series. Usually i done 3 to 15 repositionnement. PS : Zeren is very good for me this soft permit series covery. Thanks for your diagrams Ploum. That is something that I should try sometime, I mean whenever I get the equipment and necessary space. I not have a Raynox. And I´m not sure about its optics design. 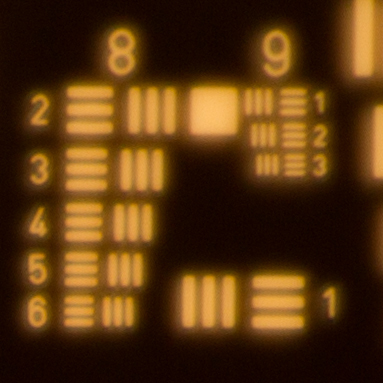 I have found that it is a 8 dioptres lens, or the same, a positive lens of 125mm focal. But is really a lens (simple or several together, to avoid aberrations) or it is a small telescope, inverted or not? I will return to my basic setup. But my friends are send me mineral samples smaller day after day and I need to find a setup that give me good quality with the 20x lenses. I have a Nikon, a Leica and a JML 20x, and the results are very similar... Is not a optical quality problem, but mine. try with a raynox drc 150. Real image is not important. - Raynox permit an adaptation of size for captor. - Permit a great optic precision with a small mecanic precision. It's not easy fr begin . i always thought that the setup of Frederic uses a two stages with a real image formed by the first stage that is magnified by the second stage, but regarding the illustrations given, i noticed that the distance between the two stages is too small for that. So either the illustrationw are wrong or my thinking - it was my thinking (merci pour votre reponse frederic - je crois que j'ai maintenant compris). I will try to share my present understanding. 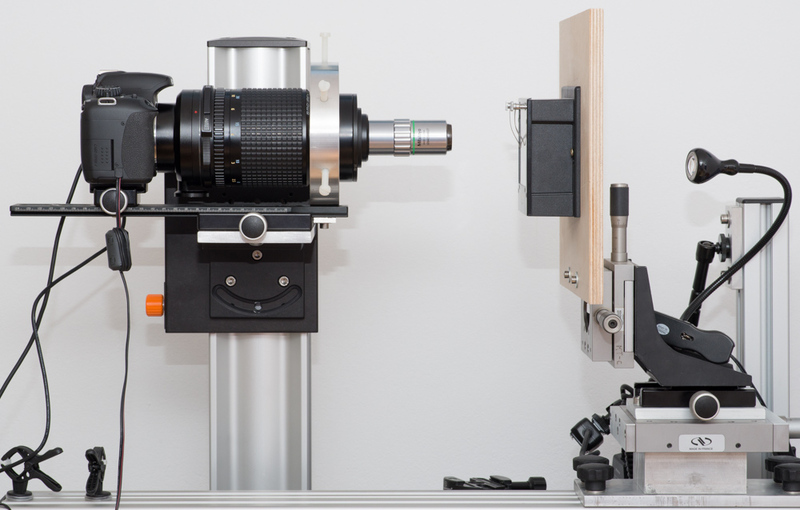 We may combine microscope objective and tube lens to one optical system with focal length f1 (which will be close to the focal length of the microscope objective, which has much smaller focal length than the tube lense). This optical system has principal planes H1 and H1' and is separated from the camera which is equipped with an objective of focal length f2 with a fixed distance to the sensor plane giving a magnification m2 of the second stage. The distance between these stages is denoted by e and varied in Frederics stacking procedure. This shows that a variation of e will have little effect on the total magnification m if m2 is chosen to be small, that is if the second stage is focussed close to infinity. If the second stage is focussed to infinity (m2 = 0) the formula simplifies to what all of us know: m = f2/f1. The stacking steps on the opject side are smaller than the steps in e by this factor. From this it is seen that setting the second stage to a small magnification yields very small stacking steps on the object side. This seems to give considerable flexibility as we set the magnification essentially by f2/f1 (assuming m2 to be small) and define our stacking steps in terms of the increments in e and the magnification of the second stage, which can be chosen independently. As Frederic has demonstrated to us his method gives good results with substantially relaxed requirements concerning optical positioning. If i look ath the illustrations i wonder whether it is necessary to combine the componon with a tube lens - i would be interested to learn if this combination gave better optical results, than the componon alone. Michael, thank you for the additional information and insight about Frédéric's setup. Clearly it is a huge advantage to speak all three languages: English, French, and Optics. As I see this, the key concept is that changing the physical length of an optical segment has only a small effect on focus and magnification, if the affected segment is near infinity focus. Let me see if I can illustrate, using fewer optical elements. What I've set up here is a nearly traditional infinity setup using a Mitutoyo 5X objective (40 mm) with a 125 mm Raynox DCR-250 placed close behind it. The setup would be exactly traditional, except that I've defocused the Raynox so that it gives magnification 0.2 when focused by itself on a nearby object. Then, moving backward the camera and Raynox as a unit, I reach this situation. If the Raynox were focused at infinity, this move would have no effect on focus. But because the Raynox is focused someplace else, the move does have some effect. 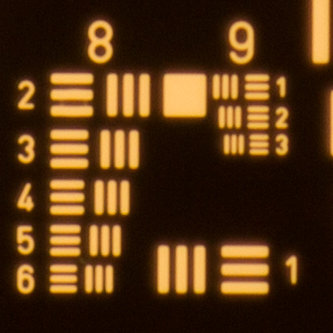 Using the focus block to measure how much the focus has shifted, I find that a 165 mm movement of the rear assembly (camera + Raynox) has shifted the focus point by only 0.75 mm. This corresponds to a finite difference of delta w / delta e = 0.75/165 = 0.0045 . I have not checked the derivation of your formulas, but I do notice that my measured value is pretty close to the 0.0041 that I calculate from your formulas given the same inputs. A slight deviation from m2 = 0.2 could easily account for that, and I did not take care to get the magnification exact. From this it is seen that setting the second stage to a small magnification yields very small stacking steps on the object side. Yes. In fact at high magnification the steps may become so small as to be troublesome. Before running the numbers, the first setup that I tried was using a 20X objective (10 mm) and a 200 mm lens instead of the 125 mm. What I observed experimentally was that in my setup focus shift then was dominated by flex in the mechanics, as the weight of the camera shifted backward. I was surprised by that, but when I run your calculation, the result I get is that dw/de = 0.0001, which means that my 165 mm of rear movement would be expected to accomplish only 16.5 microns of focus shift. Given that an appropriate step size for a 20X NA 0.42 objective is around 2 or 3 microns, that would be a rather short stack! Even with the infinite objective, I question whether the tube lens is appropriate in these setups. You may have noticed that mine doesn't have one. That was not just to make it simpler. 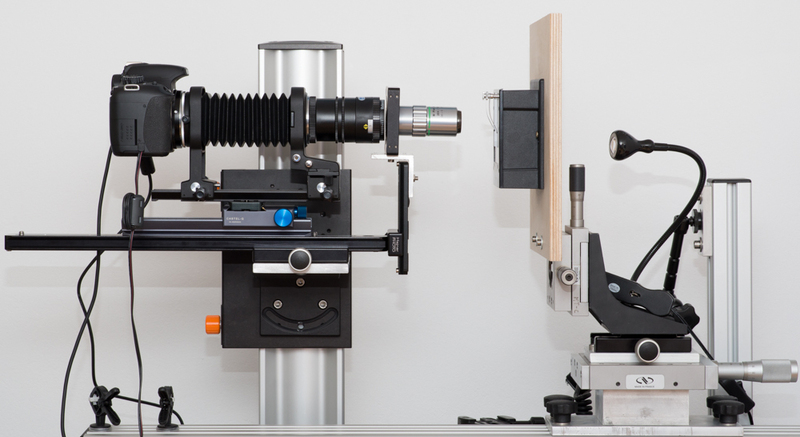 In order for the setup to work, the output from the front optics has to be diverging at a rate that matches the focus of the rear lens. Used by itself, the objective has to be dragged away from its design point to accomplish that. If I added the tube lens, as in Frédéric's setup, the objective would have to be dragged even farther away from its design point. It's a case of "too many parts". While I am impressed by the ingenuity of this focusing method, I think it's important for other readers to realize that the main advantage of this setup -- perhaps its only advantage -- is that it allows making small focus steps with low precision mechanics. 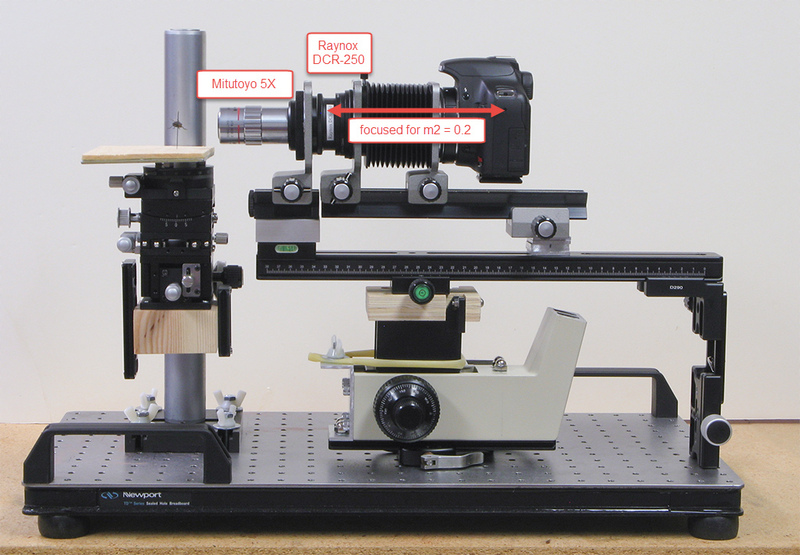 Compared to the traditional approach of using a microscope focus block or a precision screw drive to simply change subject-to-lens distance, this method has some non-trivial drawbacks. I expect that Frédéric has thoroughly mastered the technique with his own equipment, but as illustrated by Soldevilla's experience (and my own, for that matter! ), other people attempting to adopt and adapt this technique may find themselves running into unexpected difficulties. As an editorial opinion, I think this point is particularly important because the very high quality of Frédéric's mineral images may lead other people to spend time trying to make his focusing methods work for them, when their time would be far better spent on studying his methods for illumination and staging. Rik - thank you for your excellent demonstration, i’m glad to here that the formulas worked. I completely agree with your conclusions, and just cite from an email that i sent to John (dolmadis) yesterday in the afternonn. 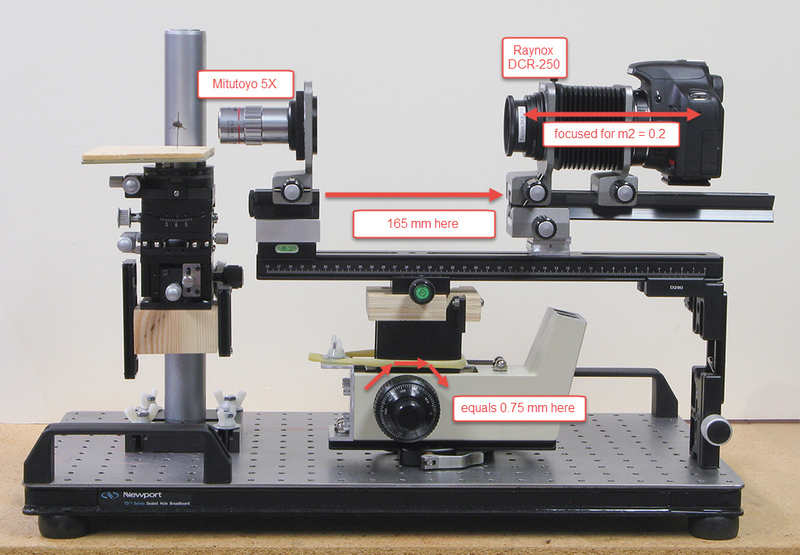 „You get really small shifts of the object plane even from a shift of the two optical stages by 1mm with respect to another (no problem to get less than a micrometer) - and what is an advantage on one side appears to be a disadvantage on the other side: Shifting in coarse steps requires to considerably shift the two stages with respect to another during a stacking procedure - running probably into vignetting or unfavorable extensions with degraded optical results. That seems to me is the reason why Frederic repositions the object several times during the stacking procedure. Well i think that one contribution (yours) is already sufficient. If you have a microscope block for positioning you should employ it with a conventional stacking procedure - i completely agree with that. 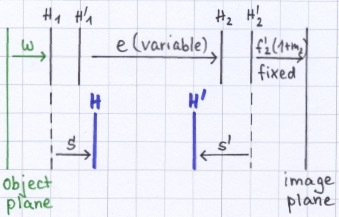 1. e cannot be chosen arbitrarily - choosing e larger than f1+f2 gives a real image between the stages. Further restrictions on e arise from the optical quality of the image. So for an estimate lets assume that we find that our optical system does not degrade too much if we shift e within a range of say 50 mm. Using a simple macro rail with steps of 1 mm then allows to perform a substack of 50 images. 2. Assume that we employ a 20x and want to shift the object plane in steps of 1 micrometer. Then dw/de has to be 1/1000. For our estimate we note that |dw/de| is roughly given by m2^2/m^2 (just to demonstrate orders of magnitude). With m=20 we find that m2^2 = 0.4 or m2 = 0.6, and see that considerable magnification is required in order to arrive at reasonable focus steps (this result cannot be very precise as this value of m2 is not small compared to one - but i was too lazy to solve the exact equations, and i think that the exact value of m2 is not required for this discussion). Assume that the optics work well with the required magnification m2. 3. After the first substack the object plane has moved by 50 micrometer. 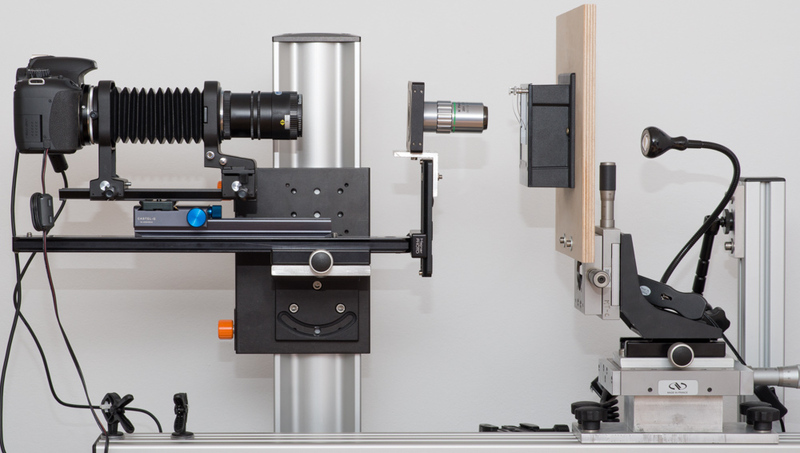 Now you can reposition the object with a second linear stage with typical resolutions of 10 micrometer. Be sure to have some overlap with the former substack and set the macro rail back to its original position. 4. Make another substack and so on. If image qualiity is ok you can work yourself through deep stacks by repeatedly performing this procedure. 1. As m2 cannot be choosen small to one in high mag work - and thats where we want small steps of the object plane - it is interesting to note that considerable variations in magnification occur during one substack: If we stay with our example we have a change of total magnification of the order of m2*e/f1 which gives approximately 5*m2 or something like 3, corresponding to 15 %, with the values chosen (f1 = 10mm with 20x). Zerene must be very forgiving in this respect. 2. I also think that the macro rail and the linear stage should be oriented parallel precisely - because there will be lateral shifts in subsequent substacks if this is not the case. As this is not so easy to achieve i assume that Zerene is also very forgiving in this respect. In conclusion the method has been proven to work, but probably (well almost certainly) requires considerable testing on the range of acceptable magnifications m2 and acceptable distances e as well as on optics that favorably combine in order to arrive at good results. It should be considered as a possible workaround for people who do not have focus blocks or comparable high precision positioning stuff. Frederic: would you please comment at what magnifications you use the raynox with the camera alone (i'm not sure whether i interpret your post at the beginning of the thread correctly, where a magnification of 1.5 is stated, is this the magnification of the second stage?) - it would be interesting to find out if that fits to what i hope to have understood. BUT this is not looking like Ploum's drawing! This will be brief, because I'm about to head out the door for several days of being offline. Close. You have shown converging rays between the front optics and the rear optics. They're actually diverging. Your diagram corresponds to the case where the rear lens has an extension that is shorter than needed for infinity focus. In that case the light from the front optics would come to a focus somewhat behind the camera if the camera and rear lens were not there. That configuration does work, and its behavior is qualitatively similar to the one that Michael talks about and that I show. Your case is also somewhat simpler to think about. There is a fixed relationship between that focus point without the camera, and the unit consisting of camera plus rear lens. As a result, changing the center distance can be understood as equivalent to changing rear extension in a traditional bellows setup. 1. e cannot be chosen arbitrarily - choosing e larger than f1+f2 gives a real image between the stages. I agree that e cannot be chosen arbitrarily, but I think the limitation is not on f1+f2. Instead it is on f2*(1+1/m2), that being the point where the rear optics would focus, in the absence of the front optics. "...shown converging rays..." I see what you're saying, but it's not quite that. It depends on those distances. It's correct if the 200mm is less than exactly 200mm. You have shown converging rays between the front optics and the rear optics. They're actually diverging. If it's more than 200mm, then the converging rays are still correct, but the rays between the objective and the tube lens diverge rather than being parallel. That throws the focus point of the tube lens further to the left, and the Raynox works like a "close-up" lens much the was it was designed to. Rik - i think there are several restrictions to the accessible range of e - but if e gets larger than f1+f2 then total f becomes negative - i'm not sure that my calculations apply to that case (to my knowledge imaging with f1+f2 < e is usually described as a succession of two imaging processes with a real intermediate image). As i was curious i wanted to find out if i was able to lay out a setup using frederics method for 20x. I figured that f2 should be sometheing like 140 mm and m2 something like 0.6 to arrive at that result with a MTTY 20x. So i used an apo-gerogon 9/150 i had at hand for a test and set the second stage to a magnification close to 0.6. Using a castel-q macro rail for positioning of the camera i made a "ploum-setup" on the m_cam. i coose an USAF test target mounted on a light box (from my slaughtered enlarger) to get an impression of the image quality achievable. Magnification reduced to 15.8 in this case. The useful range of e is obviously smaller than 10 cm. this was just a quick test, without experimenting on favorable combinations of optics. So the layout of a "ploum-setup" can be realized with the formulas given - but finding the optimal optics combinations is another task (that i do not intend to solve, as i have a setup that allows me use my objectives in a configuration for which they were designed to).